Hasselbacher Emigrants from the Aischgrund. I have often wondered what life was like in the old German countryside such that our ancestors left their homes and traveled to America and other countries. Recognizing the magnitude of the dislocation for my own grandparents who left family and familiar customs in Germany, I assume that the decision to immigrate must have reflected very difficult situations in the old country. I also assume that some of the usual forces like economic hardship, lack of food, political or religious unrest or persecution, or just plain lack of opportunity may have played roles in some places and at some times. It is my understanding that life in the country in those days could be very difficult. Leaving the countryside however did not necessarily mean leaving Germany. There was a saying, "Stadtluft macht frie;" that is to say, "City Air Makes You Free." Rural Germans flocked to the cities as well. This was the case for my great-grandfather, Johann Hasselbacher, who had a taste of city life in the military and left the Diespeck for Nürmberg in the early 1890s. Simply looking at the size of the street directories of Nürmberg in the late 19th century indicates the rapid internal migration to cities. Life was hard with few opportunities, and it was difficult to accumulate wealth. When I learned of a new historical text specifically examining 19th-century immigration from our part of Franconia to America, I had to have it. 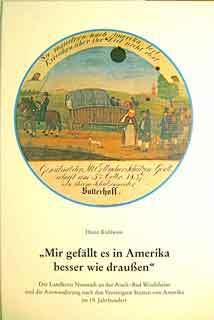 "Mir gefällt es in Amerika besser wie draußen" by Herr Heinz Kühlwein and published by the wonderful organization, Gesellschaft für Familienforschung in Franken e.V. (Society for Family Research in Franconia). The book is is written in German, but that is just another reason for me to work harder at my learning the language. The first portion of the book appears to study the reasons for, and procedures followed during the process of immigration. The second half of the book is a list of the actual people who emigrated. I am not sure of all the sources of names. Passenger lists appear to have been used, but also official applications for emigration and public announcements. I was a little surprised to see only two Hasselbachers listed because I am personally aware of eleven from the village of Diespeck alone. They are discussed elsewhere and below. To clarify the historical record, but also to point out the difficulty in assembling such historical information, I will compare what Herr Kühlwein unearthed from official sources of immigration information with what I was able to find in individual church and municipal records. The book lists two Hasselbachers. Both were daughters of a barrelmaker from Diespeck. Margaretha Barbara Hasselbacher, born August 11, 1832, emigrates with an infant in 1855. It is said that the ship arrived without the child. The second emigrant, Elisabetha Hasselbacher, born April 8, 1825, leaves the following year in 1856. I can confirm that Margaretha Barbara (birth record here) immigrated as described. The Baltimore passenger list from the ss Schiller with her name is shown here. it is indicated that he emigrated with his mother to the USA March 27, 1855. No child is listed with Margaretha Barbara's name in the passenger list. However, at the very end of the entire list it is recorded that "seven sucklings under a year" were on board. Perhaps hoping for the best outcome, I have always assumed that one of those children was Johan Conrad. Absent any other information, we may never know what happened to either Margaretha Barbara or her son. I had always assumed (hoped) that she led the way for her brother, Andreas Friedrich and his family. I believe I have identified every Hasselbacher born or living in Diespeck from the late 1600s through the early 20th century. I am aware of only two Hasselbachers from Franconia during that interval whose name contained Elisabetha. Both were daughters of the first Hasselbacher barrelmaker in Diespeck: Georg Hasselbacher (1795-1866). Georg had 10 children with his wife Magdalena Herrgott: 8 daughters and two sons. However based on the information available to me, I cannot determine which, if either of these two daughters came to America. Elisabetha the Elder, is born April 8, 1825, the date given in Herr Kühlwein's book. However no specific ship is mentioned in the book, and I can identify no Elisabetha Hasselbacher anywhere in the extensive computer database of passenger lists on Ancestry.com. (Of course it is conceivable she applied to emigrate, but did not do so.) I will ask Herr Kühlwein to help us with the source of his information about this Elizabeth. Elisabetha the Younger, was born September 24, 1834 but on her birth record is said that she died July 24, 1852 at the age of 17. Indeed a death record is also available confirming that date and age at death of 17. This presents a puzzle for me. I have seen examples of, and have been told that it was an occasional custom that an identical given name might be reused in a single family if an earlier child died. However if I have interpreted my data correctly, Elisabetha the Elder would have still been alive when Elisabetha at Younger was born. I cannot even entertain the possibility that Elisabetha the Elder was considered "lost" when she immigrated in 1856 as that did not occur until after the death of Elisabetha the Younger in 1834. This is a conundrum that I cannot solve at this time. I have had to rely on abstracts of the Diespeck church records. 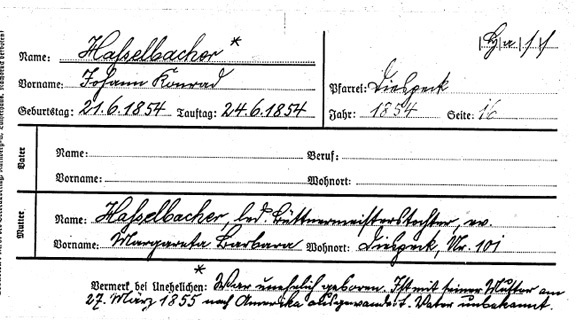 In a database of immigrants from the City Archive of Nürnberg (abstracted below) I found three Hasselbacher names who must have registered to emigrate. Various notices were required for people to get passports to make sure all taxes, debts, etc were paid. [For example, from another source I found such a notice for Johann Peter Hasselbacher who came to Illinois.] Two of the names are Elisabetha and Margaretha Barbara above. The birth dates are confirmed, and the son of Margaretha Barbara (Johann Konrad) was specifically named. The third emigrant listed was Maria Hasselbacher, a single woman born in Markt Erlbach where we know Hasselbacher families lived. For all three we are given the specific reference to Nürnberg or Neustadt records. Perhaps I will be able to find them someday. The seventh child and oldest son of George the barrelmaker was Andreas Friedrich Hasselbacher who also became a cooper. On March 3, 1872 he arrived in the Port of Baltimore on the ship Ohio. He would go to Cincinnati, Ohio. On Oct 26, 1872, his wife and six children would follow him on the ship Berlin. I know almost nothing about what happened to this family although they did become established in Cincinnati. A family tree is presented here. 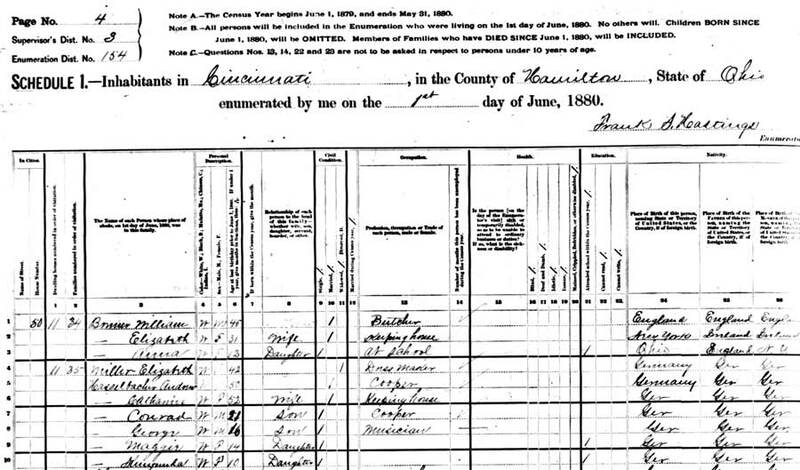 In the 1880 US Census, a widow named Elizabeth Miller is living with the Hasselbacher family in Cincinnati and is listed in the first line usually given to the head of the household. She is said to have been born in Germany and her age was given at 42. This would give a calculated date of birth of 1838 which does not fit with either of the Diespeck Elizabeths above. Of course, ages recorded in census documents are frequently inaccurate. This remains a tantalizing piece of information. One can only wonder about whether one or both of Andreas Friedrich's older sisters may have paved the way for him to come to America. Johann Hasselbacher, my GGG Uncle, was born in Diespeck on Dec 6, 1848, and immigrated to Red Cloud, Nebraska in 1871. He died on Dec 29, 1932. I cannot find information about his ship and have not made much headway on the family history. I found a relative by marriage of his daughter Alice, but have contact with no one else. My Grandfather knew he was here. Even a cursory look at immigration and passenger lists tells us that a large number of Hasselbachers came to America. Alas, I still do not know anything about them. I hope any descendants will contact us. If any of you have compiled a list of immigrants, please send it for me to share with others. The church records were very careful about recording the legitimacy, or lack thereof, of any births. Even in the transcriptions, a separate line was made available to record this possibility. I am still trying to learn the full significance of this designation. It is clear that often the parents subsequently married. At other times, even though the father may have been designated, no marriage occurred. Often these children, branded as illegitimate, seem to fall off the map. At least one, my 4G-Grandmother Katharina Margaretha Hasselbacher born 1788, had a single "illegitimate" son, Johann Konrad born 1817, who founded one of the more visibly successful Hasselbacher family lines. Johann Konrad became a tailor, helping to break the farmer's bond to the earth. I have always fantasized that his mother, perhaps a seamstress, helped teach him this profession which was handed down to his son and grandsons. I learned recently of some additional wrinkles that take this out of the realm of morality alone. In fact, couples were not permitted to marry without the permission of the church and/or the municipality. (In those times, the two were probably largely the same.) The couple had to demonstrate that they had sufficient financial means to marry, and presumably pay their fees. While there may have been some social welfare aspects to this practice, one can only imagine what would happen to children born without the option of a family. How would these children be taken care of? Whose responsibilities were they? Why were the names of the unmarried fathers so carefully sought after? I would be grateful for anyone with knowledge in this area to inform us all. I can say that as I peruse to the list of emigrants provided by Herr Kühlwein, it was very easy to find names of apparently single women with children. While it is possible that such pairs were on their way to join a husband in America, it is too easy for me to imagine desperate women without resources at home, seeking somewhere to survive with some dignity. I think Herr Kühlwein has has produced a wonderful book. I look forward to learning from it. Every time I come across some little puzzle like the one above, I end up learning so very much more, and about things I would never have thought of. For me this is one of the great rewards of studying our family history.